The Patriots go back out on the road for their fourth game in the last five as they take on the Miami Dolphins in South Florida on Monday Night Football. This is a hat and t-shirt game for the Patriots. With a win or a tie, the Patriots clinch the AFC East once again for the ninth straight time and the 17th since Robert Kraft took over the team in 1994. This week’s game will be broadcast by ESPN on Monday, December 11 at 8:30 p.m. and can be seen on WCVB, Channel 5 in Boston. Sean McDonough will handle play-by-play duties with Jon Gruden as the color analyst. Lisa Salters will work from the sidelines.The game will also be aired on the Patriots flagship radio station 98.5 The Sports Hub with Bob Socci and Scott Zolak on the call, produced by Marc Capello. The Dolphins (5-7) are coming off of a 35-9 blowout win over Denver. The team snapped a five-game losing streak and are looking to get some consistency. The Patriots and Dolphins are meeting for the 105th time overall with Miami holding a 53-51 lead all-time in the teams’ rivalry. However, the Patriots have won 12 of the last 15 meetings including the lone from two weeks ago where the Patriots rolled 35-17 behind 196 yards on the ground. Miami has issues with the run with DE Andre Branch and DT Jordan Phillips having problems in the running game. If the Patriots see these two on the same side, look for them to run right at them. While they may not roll up 200 yards on the ground again, they should still find plenty of room to be more than a complimentary piece. The Patriots passing game is averaging 292 yards per game, tops in the NFL. 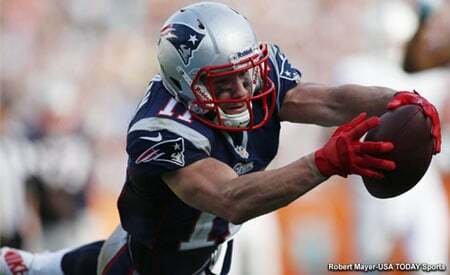 Tom Brady however, won’t have his top receiver, Rob Gronkowski in the game as he’ll be serving a one-game suspension. But…the team may get back Chris Hogan this week. He’s been at practice all week and if he’s able to go would signal a huge boost in the Patriots passing game outside the numbers. 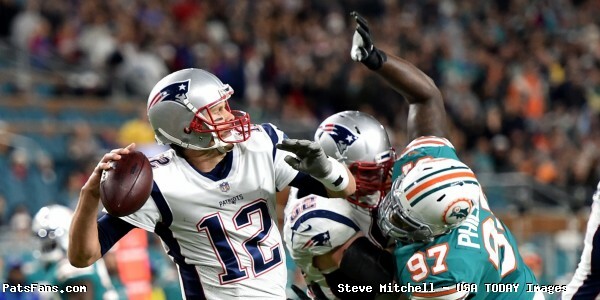 Miami got after Brady with very good pressure from everyone across the defensive line in the first matchup. They’ll need an effort like that again because their best corner Cordrea Tankersley could miss this week with ankle and knee woes. 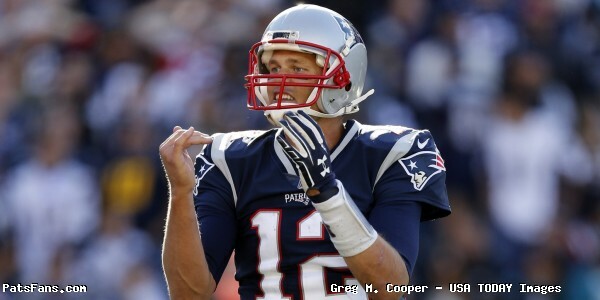 Without Gronkowski look for Brady to spread them out and try to use their quickness all over the field. They’ll try to get Brandin Cooks the ball in space and Hogan (if he plays) may get the chance to go deep on a few plays down the field. The backs will again be a major factor in both the running and passing games. The Dolphins running game hasn’t been the same since they traded the freelancing Jay Ajayi to the Eagles. The carries have been shared between Kenyan Drake and Damien Williams, but Williams is dealing with a shoulder issue and may not go. The Patriots run defense has not been good and was gashed pretty well by the Bills last week although the return of Malcom Brown should help things. But will the Dolphins have the depth to force enough leverage there? The feeling here is no especially if they find themselves falling behind again. Miami will have Jay Cutler back under center this week. He’s a different player than Matt Moore, so we’ll probably see some more shots down the field. Jarvis Landry had eight catches for 70 yards in the first one and he, Kenny Stills, DeVante Parker with tight end Julius Thomas should be much more productive than they are. The Patriots pass defense is playing tremendous right now. It is a possibility that we’ll see some of Eric Rowe on Landry this week as he has a bit of size, although Jonathan Jones matched up well with Landry in the first meeting. Look for the Patriots to be much more aggressive against this beatable Miami offensive line again. They teed off in the second half and got six sacks. Cutler isn’t mobile and the Patriots may call down the dogs this week. The Patriots’ Stephen Gostkowski is having an outstanding season. His kickoffs are pinning teams deep and the outstanding coverage units are smothering the opposition. The Dolphins have solid kickers but aren’t generating anything in the return game. The Patriots Special Teams has been scoring points, blocking kicks, and last time ran a fake punt for a big first down that set up a touchdown. This one is a divisional matchup on Monday Night so, as we’ve seen all season, anything can happen. But unless the Patriots implode, I can’t see the Dolphins beating New England this week. However, the Patriots have traditionally not played well in the heat of Miami. It does help that this one is at night so that shouldn’t be a big factor. 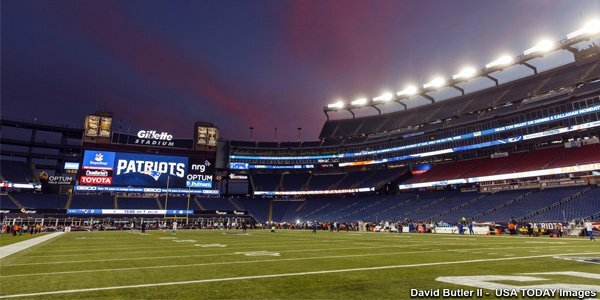 This entry was posted in NFL Commentary, NFL News, Patriots Commentary, Patriots News and tagged 2017 Patriots Season, Bill Belichick, Chris Hogan, Danny Amendola, Devante Parker, Dion Lewis, James White, Jarvis Landry, Jay Cutler, Kenyan Drake, Kiko Alonso, Malcolm Butler, Miami Dolphins, Ndamukong Suh, New England Patriots, NFL, Patriots, Patriots edge rushers, Rob Gronkowski, Stephon Gilmore, Tom Brady, Trey Flowers on December 8, 2017 by Steve Balestrieri. The Patriots return home for one game this week against the Miami Dolphins before heading back out on the road for a three-game road trip. 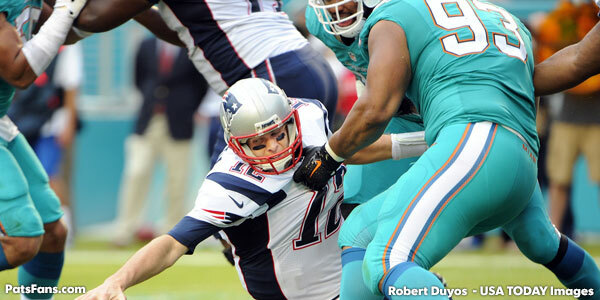 In a weird quirk in the NFL’s scheduling, the Patriots and Dolphins meet twice in three weeks. The Patriots (8-2) are coming off a very successful two-game road trip with blowout wins coming against the Denver Broncos 41-16 and last week in Mexico City against the Oakland Raiders 33-8. Tom Brady continues his torrid pace in 2017 and the defense for the sixth game in a row allowed 17 points or less. The Dolphins (4-6) have lost four in a row and in danger of falling out of the playoff race after entering the season with so much hope of earning back to back playoff berths. The Patriots and Dolphins history has been a streaky one with Miami holding an overall 53-50 lead all-time in the teams’ rivalry. However, the Patriots have won 11 of the past 14 meetings including the last eight at Gillette Stadium. The Patriots swept the series last season, 31-24 in Week 2 with Jimmy Garoppolo and Jacoby Brissett at the helm and in the regular season finale 35-14 in Miami. The Patriots running game has been improving with Dion Lewis taking over the bulk of the running game with Rex Burkhead getting the complimentary carries and James White just a few here and there. Mike Gillislee has been a healthy scratch for two weeks in a row. The Patriots haven’t run the ball a ton lately because they’ve been so adept at passing it but this week could see more emphasis on the running game. Miami for the first month of the season looked vastly improved in the running game. But during their losing streak, they’ve been getting gashed by the run. Having released Rey Maualuga at middle linebacker won’t help matters as he was impressive as a run stuffer. Look for the Patriots to mix things up quite a bit this week. Miami’s defensive ends will be looking to influence the passing game by teeing off, so they’ll attempt to run right at them on Sunday. The Patriots passing game is averaging over 300 yards per game, tops in the NFL. Tom Brady has been brilliant about spreading the ball around to a plethora of different receivers and they’re continually able to find mismatches. With their wide receivers banged up, they haven’t missed a beat. Miami’s pass defense is allowing just 229 yards per game but opposing QBs are completing nearly 70 percent of their throws and have an average passer rating of 104.3 which is second worst in the league. Look for Brady to work the tight ends, Rob Gronkowski and Martellus Bennett as well as the running backs, James White and Rex Burkhead heavily into the mix this week. The Dolphins pass rush has had issues getting to the QB, and if Brady has time, he’ll carve them up in death by 1000 cuts. The Dolphins traded their top running back Jay Ajayi to the Eagles earlier in the season and now are going with Damien Williams and the intriguing Kenyan Drake who’s averaging about 5.5 yards per carry. The Dolphins have been struggling to run averaging just 80.4 yards per game and score, with just one rushing touchdown on the season. The Patriots run defense has struggled in 2017, with Malcom Brown injured and Vincent Valentine and Dont’a Hightower on IR, the middle of the line has been suspect. Coupled with less than stellar play that we’ve come to expect from Alan Branch, it is an issue. The Raiders ran the ball effectively last week but the Patriots jumped out to such a big lead they were forced to abandon it. Look for Miami to feature Drake more this week. Williams has been the de facto starter since Ajayi left but that may change as they are looking for answers to get their offense untracked. And we feel here, Drake will have a solid day on the ground. Miami’s passing game has been mired in mediocrity since Ryan Tannehill went down in camp. The team signed Jay Cutler and he hasn’t gotten it done. With the targets he has in the passing game with Jarvis Landry (3rd in the NFL with 67 catches), Kenny Stills, DeVante Parker, Julius Thomas at tight end and the running backs, the Dolphins passing game should be its strength. The Patriots pass defense is playing much better since a nightmarish start to the season. Stephon Gilmore and Malcolm Butler did a fine job on the duo of Michael Crabtree and Amari Cooper last week. Landry is their go-to guy to move the sticks but Stills is the Miami big play guy and if Eric Rowe isn’t ready to go, that will fall to Jonathan Jones, who has played well this year. Cutler was in concussion protocol this week but did return to practice, albeit in a limited fashion on Thursday, which means he probably passed. If so, he’ll probably get the start but one has to wonder if the Dolphins would be better suited to go with the steady if unspectacular Matt Moore in there. The Patriots’ Stephen Gostkowski was the AFC STs Player of the Week after booting a pair of 50+ yard field goals (62 and 51) in a 4-4 day against the Raiders. His short kickoffs coupled with outstanding coverage has put the Patriots in great advantageous position. Ryan Allen’s punting has been steadily improving and it seems like every week the Patriots are getting big plays from their STs units. The Dolphins Special teams have been playing very well. Their own coverage units are very solid and they have a pair of very good kickers but their return game hasn’t had a big impact. With the way New England’s STs units are playing right now, they get the nod. This one will be an intriguing one to keep an eye on. The Patriots will want to get off to a fast start and see if Miami, who has dropped four in a row answer the bell or pack it in. Two of their four losses in the last month have been blowouts. The Patriots secondary has been much, much better the past month and I look for them to continue that trend this week. It is a much different atmosphere for the Dolphins when they play at Foxboro. They haven’t won in New England since the Wildcat game in 2008 when Matt Cassel was the QB for New England. Look for Tom Brady to spread the Dolphins out and find the mismatches underneath. Getting T.J. McDonald back from an eight game suspension should help in defending the tight ends, but he and Reshad Jones can only do so much. The running backs in the passing game may open up some down the field options for Brandin Cooks. 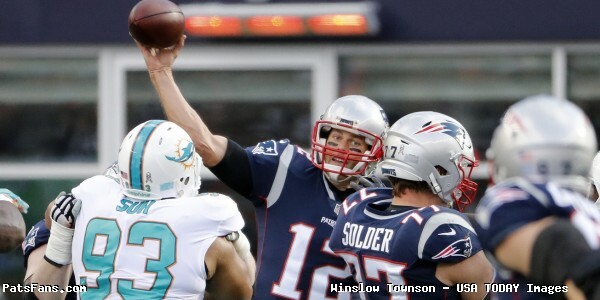 This entry was posted in NFL Commentary, NFL News, Patriots Commentary, Patriots News and tagged 2017 Patriots Season, Bill Belichick, Cameron Wake, Chris Hogan, Danny Amendola, Devante Parker, Dion Lewis, James White, Jarvis Landry, Jay Cutler, Kenny Stills, Kenyan Drake, Malcolm Butler, Martellus Bennett, Matt Moore, Miami Dolphins, Ndamukong Suh, New England Patriots, NFL, Patriots, Patriots edge rushers, Rob Gronkowski, Tom Brady, Trey Flowers on November 24, 2017 by Steve Balestrieri. After a very good 2016 where they made the playoffs, the confidence was high in Miami this season. The team had surrounded Ryan Tannehill with a very nice array of weapons and the defense was looking to make a big turnaround. But things haven’t worked out that well. Tannehill was hurt in training camp and was lost for the season. The team signed Jay Cutler and he hasn’t worked out. The Dolphins offense has sputtered along and is currently 30th in the NFL in yards and 31st in scoring averaging just 15.7 points per game. Jay Ajayi was traded in midseason and the running game is mired in neutral. The defense, while the middle of the road in terms of yardage is 25th in points allowed and hasn’t made the strides that they envisioned. Down But Not Out: Miami’s dropped four in a row and is now sitting at 4-6, but they are still very much in the hunt for a playoff spot. They’re only a game behind the Bills and Ravens who are 5-5 for the final playoff berth. So while head coach Adam Gase must get things turned around quickly for the Dolphins, a loss this weekend doesn’t spell the end of their season although no one wants to lose five straight. Parker Has Been Disappointing this Season: Jarvis Landry has been the go-to guy in the Dolphins passing offense in 2017. He’s been the guy to move the chains and leads the team with 67 catches and 6 touchdowns. Kenny Stills has been their home run threat averaging 14.7 yards per reception with 40 catches with 5 touchdowns. But the third part of their three-headed monster at wide receiver, DeVante Parker has been a disappointment this season. He has just 34 catches for 404 yards and one touchdown. This was supposed to be both Parker and Tannehill’s coming out party this season and despite a stellar training camp where he turned heads and was expected to light it up in 2017. Part of the reason is a nagging ankle injury that caused him to miss some time. He’s still not 100 percent and the feeling around Miami is beginning to develop that Parker is just one of those players that just won’t perform at a high level unless he’s feeling great. While all eyes will be on Landry this week, the guy to watch is Stills who they’ll probably operate out of the slot against Jonathan Jones. Miami quarterbacks have a 117.4 passer rating when targeting Stills in 2017. For Parker, who was targeted nine times last week and caught just four passes for 26 yards, Dolphins QBs have just a 77.9 passer rating when targeting him. Running on Empty: The Dolphins running game is averaging just 80.4 yards per game this season which is just 29th in the league. They jettisoned Jay Ajayi who is currently loving life in Philadelphia. That leaves them with Damien Williams and Kenyan Drake. Williams has been getting the most reps but that may be about to change. Williams ripped off a 69 yard run last week. But his other 10 runs netted just 9 yards. Drake meanwhile is averaging a stellar 5.5 yards per carry and has the blazing speed that makes him dangerous. Tight end Anthony Fasano who has played with Jamaal Charles and DeMarco Murray likes what Drake in limited reps has been able to do and thinks he’s just scratching the surface. In an interview with Palm Beach Post, he raved about the 2nd year running back. Dolphins Pass Defense Will Be Tested This Week: On the surface, Miami’s pass defense looks to be very stout. They’re allowing just 229.3 yards per game and have given up just one pass play of 45 yards or more all season. But opposing quarterbacks can be patient and work their way down the field as opposing QBs have completed 67.6 percent of their passes. Miami has only three interceptions on the season and has allowed 18 touchdown passes. Opponents’ passer rating is 104.3. This type of game plays into what the Patriots and Tom Brady do well. One area to monitor will be the tight ends. Miami has struggled to cover tight ends and the Patriots can throw to three at any given time. Rob Gronkowski will be a matchup to watch this week. Whoever gets him and it may be two defenders it will open up single coverage on someone else. The Dolphins pass rush hasn’t been as productive as they’ve hoped. They’ve logged just 17 sacks, the same number that the Patriots have. Cameron Wake leads the way with six and Ndamukong Suh has 3.5 and as always, they’ll have to be accounted for. Wake seemed to tire at the end of games lately so it will be imperative for the coaches to limit his reps and work in Charles Harris and William Hayes into the lineup. Check back later this week with us and we’ll have a detailed breakdown of all the key matchups in this game. Listen to our Patriots 4th and 2 podcasts on blog talk radio as the writers Russ Goldman, Derek Havens and I from PatsFans.com discuss the latest Patriots news Tuesdays at 12 noon. 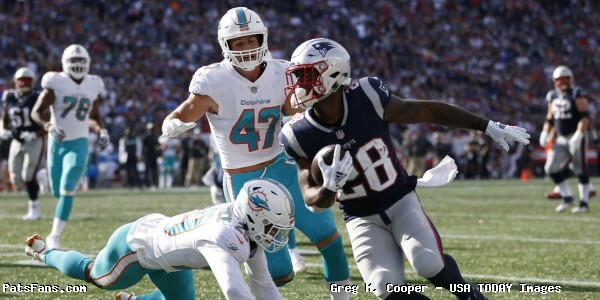 This entry was posted in 2017 Patriots Season, NFL Commentary, Patriots Commentary, Patriots News and tagged 2017 Patriots Season, Bill Belichick, Cameron Wake, Chris Hogan, Devante Parker, Dion Lewis, James White, Jarvis Landry, Kenny Stills, Kenyan Drake, Malcolm Butler, Martellus Bennett, Miami Dolphins, Ndamukong Suh, New England Patriots, NFL, Patriots, Rob Gronkowski, Tom Brady, Trey Flowers on November 22, 2017 by Steve Balestrieri. With the Patriots still being active in free agency, it is time to conduct our Patriots Mock Draft 2.0 – Early April Edition. Obviously with the moves their making with available veterans it will affect the way they approach the draft. 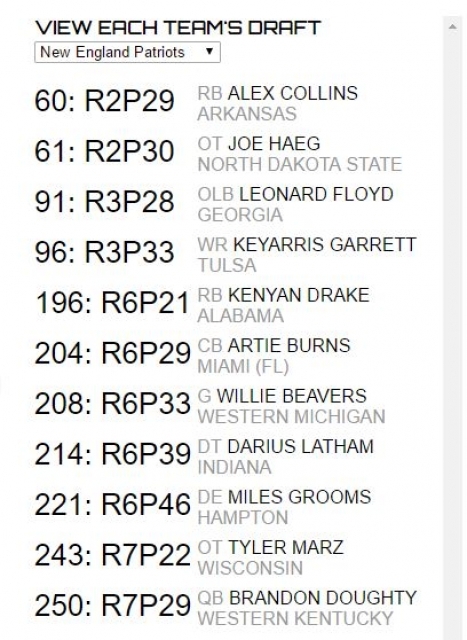 There is a fascinating tool to use for doing a mock draft made possible by the guys over at Fanspeak.com that we touted last year and is even more fun to use in 2015. All of the big boards differ quite a bit and the site has a random selection process that picks for the other 31 teams based upon the best player available and team needs that are constantly updated. For this second mock draft (4-2), I used the big board of Optimum Scouting. I say this because the big boards differ a great deal depending upon the board chosen. I did another using a different big board and the results were vastly different. Looking at how the board plays out, I think we can all expect the Patriots to make a move to move into either the 4th or 5th rounds as the talent level begins to drop steeply between the third and sixth rounds. With the continued moves the Patriots are conducting in free agency, it makes their job a bit easier once the draft rolls around. Without as many holes to fill, they can be flexible and opt for the best player available or move up and down if they so choose. It was a surprise to see both a well-known RB and CB plummet down the draft boards until they were available much later that we thought earlier… Read on. Round 2, Pick #1 RB Alex Collins, Arkansas: Collins earned second team All-SEC honors behind Heisman winner Derrick Henry in 2015 where he had his third 1000-yard season in a row, rushing for 1577 yards and 20 touchdowns for the Razorbacks. Collins has good size at 5’10”, 217 pounds and was a TD machine getting 32 scores in three years. Great vision and patience, keeps his shoulders square to the line of scrimmage and stays low with excellent pad level thru the hole. Displays very good hands out of the backfield and is very consistent at finding daylight and moving the sticks. His major red flag is ball security, with 16 fumbles over the past three seasons. Round 2, Pick #2 OT Joe Haeg, North Dakota State: Haeg was a 4-year starter at NDSU and is versatile, playing both tackle spots. Athletic at 6’6, 304 pounds, he could use some bulking up at the NFL level as well as building up his core strength. Haeg uses his length to his advantage in pass protection and has good agility and lateral quickness to get to the edge in the running game. His run blocking needs to improve a bit. Selecting him in the 2nd round may be a bit of a reach, but with the NFL strength and conditioning program and being coached up by Dante Scarnecchia, Haeg could be a nice pickup. Round 3, Pick #3 OLB Leonard Floyd, Georgia: Here was the first of a few surprises in this draft as Floyd fell all the way to Round 3. He’s been widely mocked to go in the 1st in many spots. With a playmaker of his caliber, he was too good to resist. Floyd has great length at 6’4, 244 pounds, and is a rangy, athletic player with off-the-charts numbers in the vertical (39.5 inches), and in the broad jump (127 inches) which for a player of his size is fantastic. He ran a 4.60 time in the 40-yard dash and a 7.18 time in the 3-Cone Drill. Floyd is extremely versatile and played ILB, OLB and as a down lineman for the Bulldogs. While his production wasn’t eye-popping, he led the team in sacks for three seasons in a row. He can rush the passer by blitzing off the edge and cover in space. He needs to add some beef before he can set the edge in the running game but would be a great addition in the Pats sub-packages. 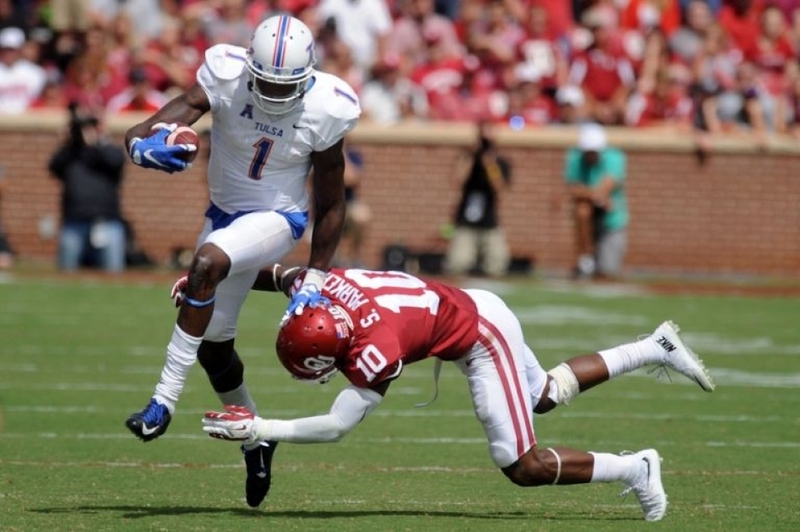 Round 3, Pick #4 WR Keyarris Garrett, Tulsa: Garrett is a big-bodied WR (6’4, 221 pounds) who had a tremendous 2015 in the high-flying Tulsa offense. He grabbed 96 passes for 1588 yards and eight touchdowns. He’s a huge target that can go up and catch contested balls in space. Dropped only 3 of 99 catchable balls in 2015. Once he gets his hands on the ball, he can make opponents miss and forced 21 missed tackles last year. He ran a limited route tree at Tulsa and his route running needs to get crisper but he has all kinds of potential and the Patriots have the offensive personnel now that they can take their time with him to develop him into a big target for the offense. Round 6, Pick #5 RB Kenyan Drake, Alabama: Shocked to see Drake still available on this mock. Drake was the #2 back to Henry in Alabama but the 6’1, 210 pound back has good size and is explosive as both a runner and a pass receiver. Has quick feet that never stop moving and he’s elusive in the open field and has the ability to make people miss. Extremely versatile, Drake was sometimes split out as a slot receiver where his value as a receiver was showcased. He can run, catch the ball, has been a kick returner and blocked a punt on special teams. He’s perfect insurance for Dion Lewis, in case he’s not ready to start the season while recovering from his ACL injury. Round 6, Pick #6 CB Artie Burns, Miami: Another shocker here as I expected to see Burns gone by Round 2 at the latest. Burns has good size at 6’0, 190 pounds with excellent ball skills and the ability to play press man coverage or zone. Another versatile guy, he was a kick returner and is a very mature young man, foregoing his senior season to care for his two younger brothers and a son after his mother died in October of a heart attack. Round 6, Pick #7 OL Willie Beavers, Western Michigan: Beavers was a three-year starter at left tackle at Western Michigan and has very good size at 6’5, 321 pounds. He has good athleticism and agility with quick feet which aids in pass protection. He’s quick off the snap and is able to slide and protect against speed rushers on the edge. Good run blocker that is able to fire out, and push him man downfield with leverage. Has no major weaknesses, he just needs to fine tune his game, something Coach Scarnecchia will be bound to do. Round 6, Pick #8 DT Darius Latham, Indiana: Latham was a two-year starter for the Hoosiers playing both the one and three-technique in the hybrid defense, improving every season. He has good size at 6’4, 311 pounds and shows good lateral agility and strength. He can overpower blockers at the point of attack. Plays with a mean streak. Plays a bit upright and doesn’t have great vision. Latham has some red flags for off-field issues. Was suspended twice for violation of team rules and for an altercation with the student ethics committee. Round 6, Pick #9 DE Miles Grooms, Hampton: Grooms is a small school stud, playing for Hampton but the 6’3, 251-pound edge player has dominated and is looking to make the big jump to the NFL. He projects to be a strong side linebacker in the NFL and has the speed and athleticism to be able to cover in space and blitz off the edge. He has excellent initial burst, quick feet, and the flexibility and knee bend to consistently force tackles off balance. Round 7, Pick #10 OT Tyler Marz, Wisconsin: Marz has good size at 6’6, 316 pounds and played well for the Badgers for the past three seasons. He has decent but not great arm length at 33.5 inches. He’s a good, tough run blocker but at the East-West Shrine game, struggled against good pass rusher in one-on-one drills. Probably a fit at right tackle or guard is in store for him at the NFL level. Round 7, Pick #11 QB Brandon Doughty, Western Kentucky: Doughty was a three-year starter at WKU and finished up his FBS career with 111 TD passes (15th all-time), and had the 10th best career completion percentage at 68 percent. This entry was posted in Patriots 2016 NFL Draft, Patriots Commentary and tagged 2016 NFL Combine, 2016 NFL Draft, 2016 Patriots Draft, 2016 Patriots Mock Drafts, 2016 Patriots Roster, 53 Man Roster Projection, Alex Collins, Artie Burns, Bill Belichick, Brandon Doughty, Darius Latham, Dion Lewis, Joe Haeg, Kenyan Drake, Keyarris Garrett, Leonard Floyd, Miles Grooms, New England Patriots, NFL, Patriots, Patriots edge rushers, Rob Gronkowski, Tom Brady, Tyler Marz, Willie Beavers on April 4, 2016 by Steve Balestrieri.